Ever been in an escape room with no digit locks? 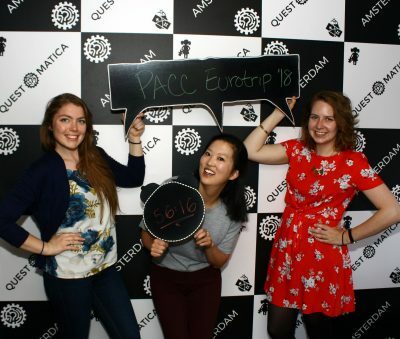 Questomatica experiences in Amsterdam are amazing game activities for both beginners and advanced groups. A real-life adventure with unique puzzles, riddles and tasks where you are the main characters. Two real and immersive experiences with strong storylines as well as lights and music creating the feeling of being inside a game or movie. Highly recommend the Arcade Invasion room. 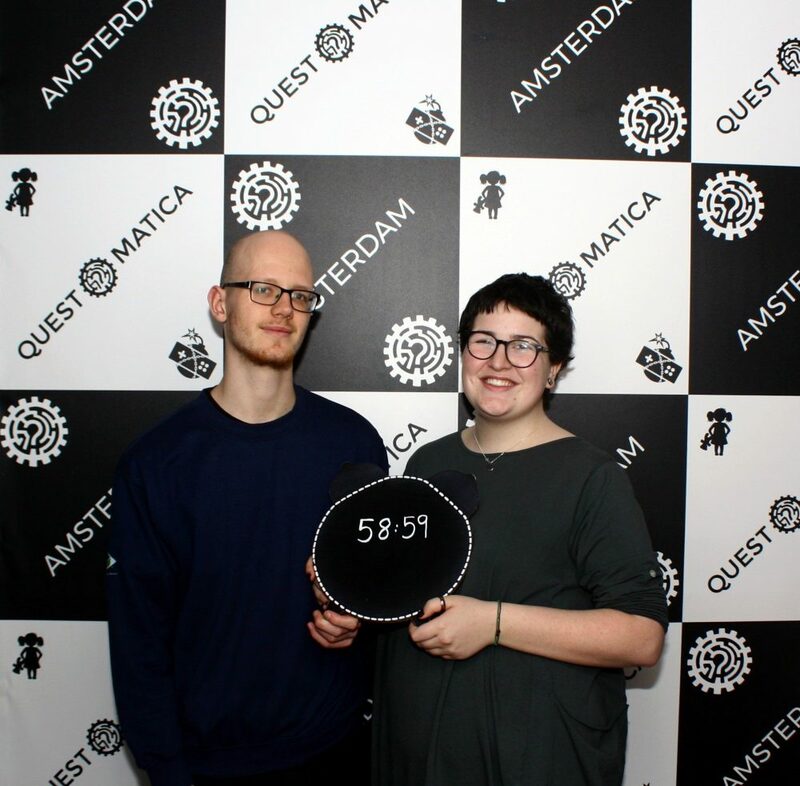 The quality of the puzzles and room design was exceptional, not to mention the space outside the Escape Rooms are also nicely decorated (and there were cookies). English or Dutch speakers will have no problem either way. We played with 3 players and had no problem. Overall, very satisfied with the experience. One of the best escape rooms I've done (of the 10+ I have completed). We played both games available at their Amsterdam location: “Arcade Invasion” and “Wake Up!” We started with “Arcade Invasion” – we may have been a bit tired as our start time was at 20:15, but we shook out our grumps and our brain-fog quickly enough. After a few early nudges in the right direction (thank you, Viktoria!) we were off and running! So many fun, unique, and 80s-arcade-themed puzzles! Such a blast! After we finished “Arcade Invasion,” our host, Viktoria, asked if we’d like to book the other room for a 20% discount. Absolutely we would! 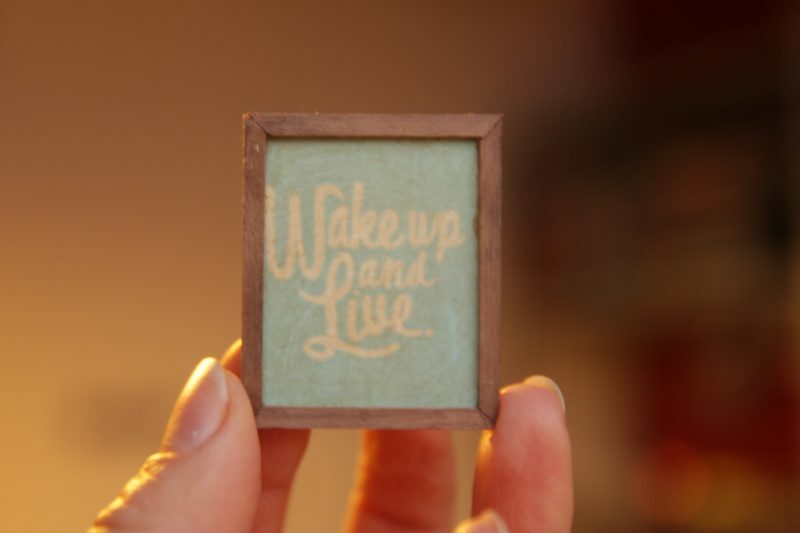 We were initially concerned, though, that “Wake Up!” would be scary – it isn’t. It might be a little bit creepy and ominous, but nothing so frightening that we would have nightmares or anything like that. 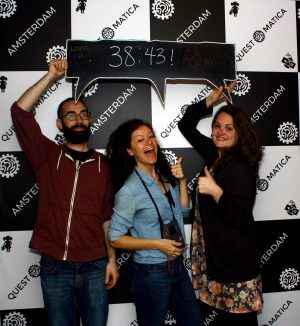 All in all we had a very pleasant time at Questomatica for our last night in Amsterdam. A must-do for anyone who enjoys escape rooms, puzzles, the 80s, arcade games, fun, and/or adventure! "Matilda - Wake Room - So much fun!!!!" 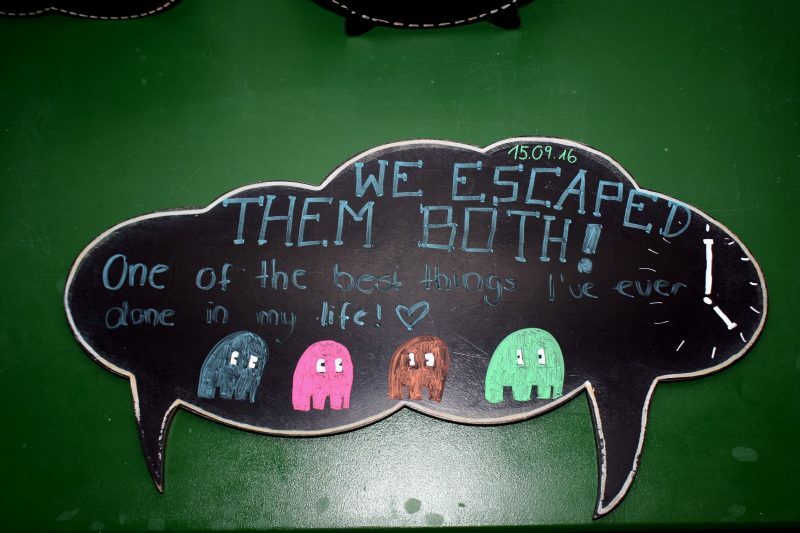 I went with my husband and it was our first escape room experience and we both LOVED it!! We were greeted by lovely staff especially Daisy who talked us through everything first and answered any questions we had. We were then totally immersed in the game for the next hour, time flew by. "A magical journey through a Creepy dream. " 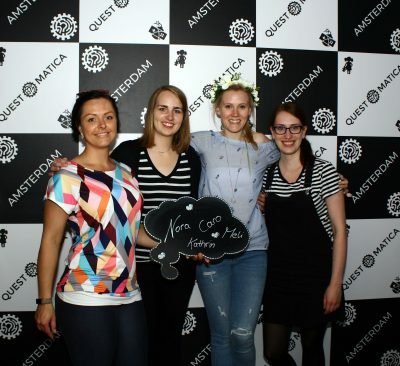 The Wake-Up escape room was part of our treasure hunting through Amsterdam for our bachelorette´s party. The bride to be needed to find different small presents somewhere throughout the city. Daisy, the host of Questomatica, was so kind and placed the gift very well hided in the escape room. Also the room itself is really fun and really not easy! :-) Great experience! 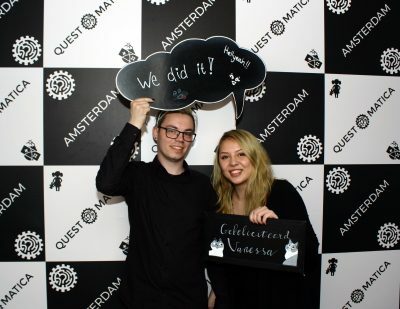 Excellent escape game, nous sommes un couple d'habitués des escape games en France et avons voulu tenter l'expérience à Amsterdam sur un thème qui nous plaît et n'existe pas chez nous. La salle Arcade Invasion est absolument géniale, beaucoup de technologie et mécanismes bien pensés, musique et jeux de lumières bien orchestrés, les énigmes sont top. L'accueil était super également. Pour les escapeurs rodés comme nous elle sera plutôt simple (sortis en 41min sans indice, à 2) mais terriblement innovante ! Pour info la GM nous a précisé à l'entrée que les indices sont disponibles en 9 langues dont le français. On reviendra tester la deuxième salle lors d'un autre voyage. I did the Arcade Invasion with 5 friends. We all had a great time! The set design and theme were worked out excellent! Together with the original setup of puzzles it created an atmosphere I have never had during an escape room. It felt like we were on a real adventure. I would recommend this to everybody! We were a group of 11 and booked both rooms for one hour. We made it out and it was great fun. The set up is very different from other escape games I have been before, the arcade one is really cool. We did it as family + friends with 2 kids aged 8 1/2 and almost 11 and they were totally into it & so much better than the adults! I especially liked the fact that all is based in logic & mechanics and no ipad / video / virtual reality is involved! And winner from age 7 to 75 in our group! We played the two rooms of Questomatica in a row...it was amazing ! 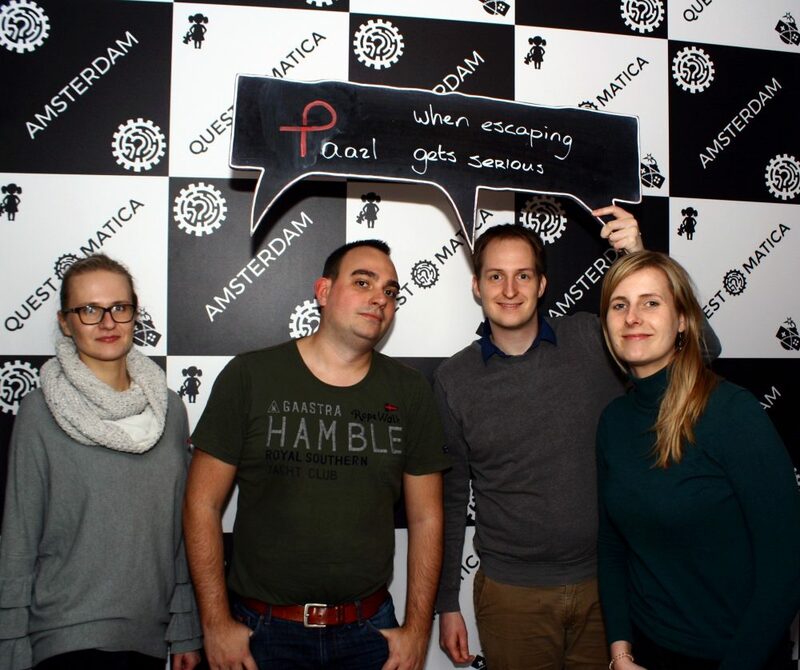 We are a trained team, that played numbers of rooms (over 200 so far, in over 10 countries), including 11 in Amsterdam, and this one definitely is is the top 3, maybe the very best. In "wake up", one really feels like trapped in a dream of a little child. The design of the room is well thought and...just perfect. The riddles are innovative and in complete adequacy with the theme. We are 4 players, and everyone was able to take part equally in the game (which is very uncommon). If you want to feel the wow effect, just go to this room right now ! You are not a fan of arcade games ? It does not matter, you will like "Arcade invasion" ! Not all of us used to play such games, but all loved the room. Again, Questomatica knows how to give the right atmosphere to the theme. The games are funny and sometimes really unexpected ! 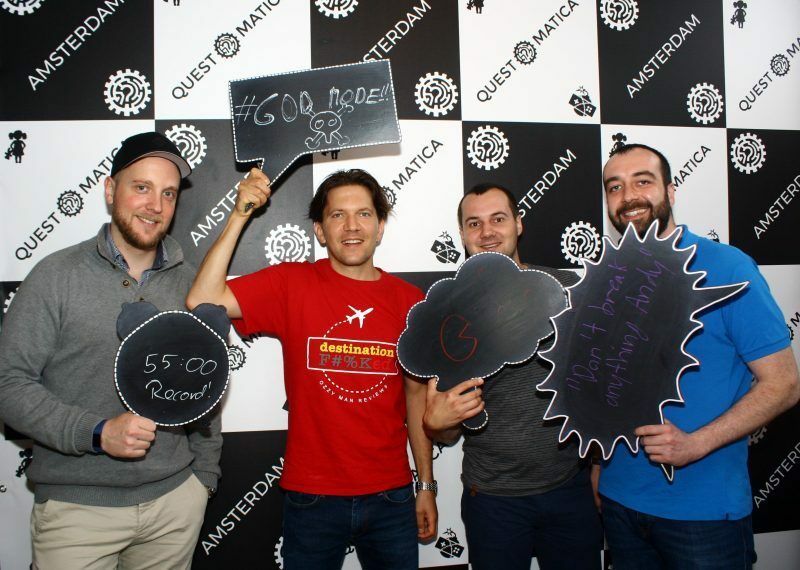 Questomatica, please let us know when you open a third room, we take the next flight for Amsterdam ! This room is full of surprises and cool puzzles that are very unique! Thanks to great sound and light effects, I was really on the edge of reality and a little girl’s dream. Location of the room is very convenient if you’re in Amsterdam city center and want to take a break from visiting museums, trying something that you will remember from your trip to this city!!! The other reviews don’t lie when they say it’s tricky with only two people, but not impossible! Such a fresh idea for an escape room, with awesome props and settings to the room. Highly recommend!" With a group of colleagues I visited both rooms (Arcade Invasion and Wake Up!). Both are extremely fun and engaging. I loved Arcade Invasion especially because of the art. I'm a fanboy for the retro 1980/1990's video game style. I've done escape rooms in several major cities and this one's probably the best. Will certainly return to try the other room! 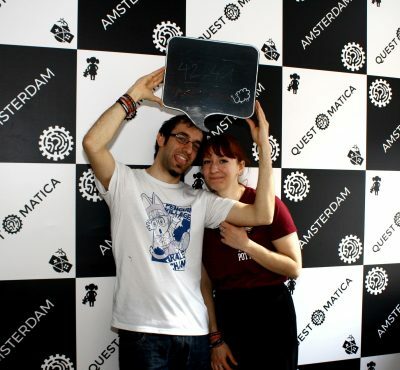 Questonatica’s Arcade Invasion was the smartest, most well thought out escape room I have ever done! Every puzzle was brilliantly thought out and it felt like you were in another world for an hour. The team have put so much effort into everything here and it’s a must for anyone with a spare hour in Amsterdam. Really impressed with both the rooms questomatica offers. Compared to all the other rooms we have done over the last years, this was something new. The design, the level of technology and the flow of the game, was superb. No boring moments and no mindless tasks! Our game master put us into the mood and timed her hints/help to perfection. Not easy with a group of 6 speaking Norwegian in the room :) Would rate these rooms top 3, of all the rooms I have done. Thank you Questomatica! "Our teenage dreams came true!" Last year we experienced their Wake Up room; which was already amazingly well designed. This time we took the Arcade challenge; a complete differently story with even more technology and lots of fun gimmicks to make the gamer experience a great adventure. Highly recommended for experienced escape room fanatics on the search for something new. This is a great outing for a little team building event with your colleagues. Both "Wake Up!" and "Arcade invasion" groups were very satisfied. I personally recommend doing what I did and taking your upper management for a round of "Arcade invasion". The hilarious moments in the darkness will stay in your memory forever. The rooms are not too hard, but not too easy either. Unlike some other rooms I tried before, the staff is very responsive and the contraptions are well designed. The physical nature of the escape room puzzle means that sometimes you will push or pull, or twist something not hard enough, or the contraption doesn't work at the 1st attempt. In some rooms, you can get stuck for 20 minutes because of this. Luckily, this is not the case with Claustrophobia. The rooms are in great technical state and the staff is ready to promptly send you rhymed encouragement if you are being overly delicate with a device. Thumbs up, staff, you're doing great. Since the rooms are fairly "streamlined", with relatively few opportunities to get badly stuck, and not too long solving time, I think this might be great place for families or people wishing to start their adventure with escape rooms. "Wake up! and Arcarde Invasion - Lot of Fun!" Last Weekend we've played Wake up! and Arcarde Invasion back to back. Both rooms are really entertaining, challenging and a great example for storytelling in escape rooms. Creative riddles meet really atmospheric rooms. We've enjoyed our stay, especially thanks to our great gamemaster. My new #1 escape game I have ever played! And I have played like 15 different all over Europe now.. trust me, this here is something extremely awesome! No spoilers.. but you will not see any number locks.. It was so much fun !!! It was the first thing we did when we first arrived to Amsterdam. The decoration suited the theme perfectly and the game itself was so smart and very challenging in a good way. 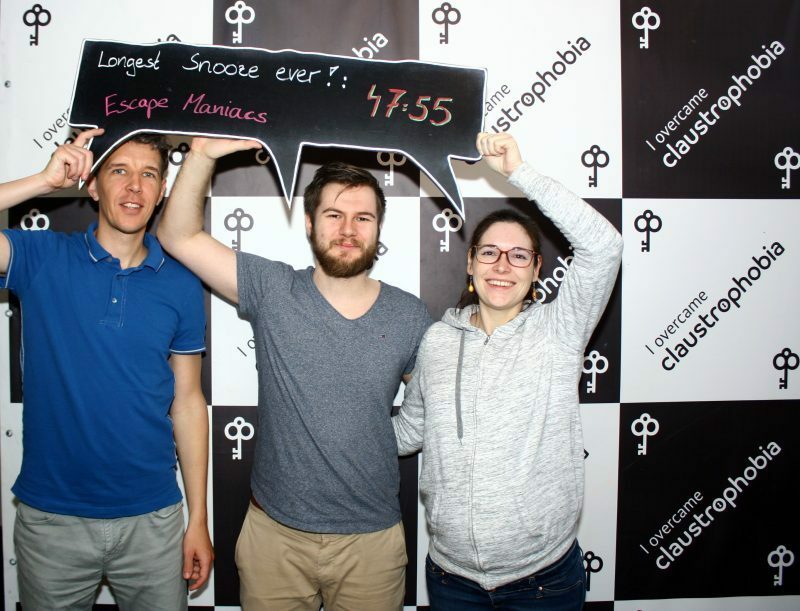 My friends and I are game masters back in our country so playing an escape game was definitely something we had to do, but they really did impress us very much! Great experience, and I would definitely try out their other rooms when I go back to Dam. 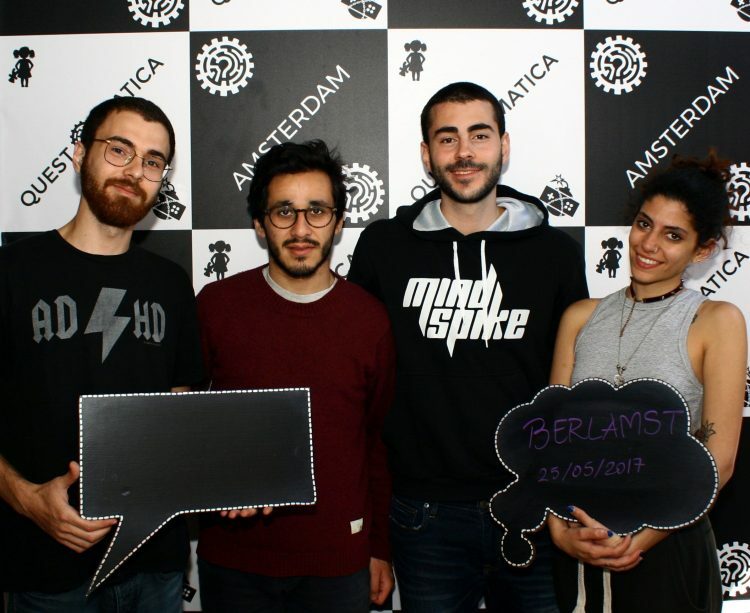 Once upon a time the small team of quirky artists-scientists-gamers came together to create real life escape room experience in Amsterdam. They mixed the technology with the gaming to get a real immersion where the game objects are real, tasks challenging and players must not only escape from a locked room, but lose themselves in the quest. The mixture was named Questomatica, where ‘Quest’ is an adventure, and ‘Automatic’, because this adventure is filled with a wide range of sensors to make you feel like you would be inside a video game or a movie. 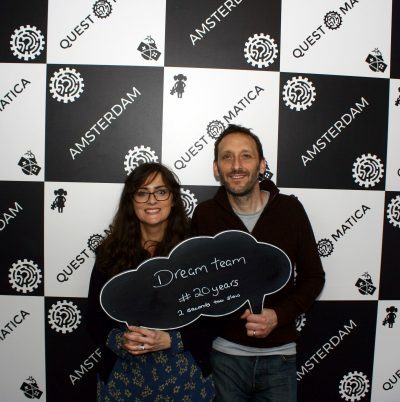 With over 10 years of experience in teambuilding the team of Questomatica opened 2 completely different and automated escape experiences in Amsterdam to bring this type of activity to a new level. Moment-to-moment our rooms surprise gamers and challenge the limits of their creativity and imagination. 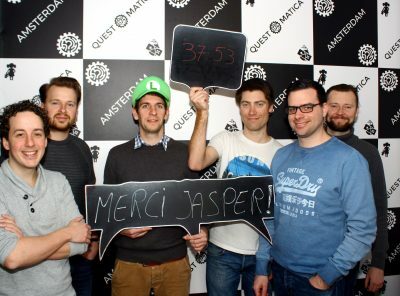 These quest experiences are more than locks and puzzles – these are the immersive experiences that leave reality far behind and make all the team work together to reach or …not to reach the victory! So put down your phones and game consoles, do something unexpected, and bring your team on an unforgettable adventure. Arcade Invasion is the latest and completely mind-blowing creation of Questomatica. It took the creators over 15 months of construction to design the only space in Amsterdam where teams can step into the world of 20th Century arcade games. Walk around 8bit landscapes, see what is inside the brick question box and fight the invaders face-to-face with the help of a pixelated laser gun! One child under 12 years old plays for free, keeping the total group size 6 max. Matilda’s dreams are always happy and cheerful, but this time something went wrong. Thousands of fantasies, riddles and illusions got mixed up in a mysterious and unpredictable knot, and you are trapped right in the middle of it! Become a part of an exciting adventure full of unexpected twists, unique tasks and unusual riddles. Carefully designed setting, light and sound effects create a truly immersive atmosphere providing experience that will be difficult to forget. One child under 12 years old plays for free, keeping the total group size 5 max. We will ask you to leave outside your bags, phones, tablets, laptops, lockpicks, screwdrivers, pins, scissors, pliers, saws and any other tools and devices. All you need is your brain, your hands and a strong team spirit. There are no tasks that require physical or brutal force. If something doesn’t open or move - do not force it. Light bulbs are light bulbs. This is not a computer game. Everything is real, so lamps run on electricity and if you break glass you may cut yourself. The game masters have the right to refuse admission to anybody suspected of being under the influence of drugs or alcohol. In this case there will be no refunds. It is a game where you need to focus and communicate. It will spoil everybody’s fun if you come straight from a pub or coffee shop. Cameras and microphones are installed in every room. In case something goes wrong the game masters will immediately come to help you. Please do not discuss the details of the game right after you left the room - you can spoil the fun for those who have not played yet. Which escape game should I choose? If you are new to escape games, it is recommended that you begin with WakeUp!. 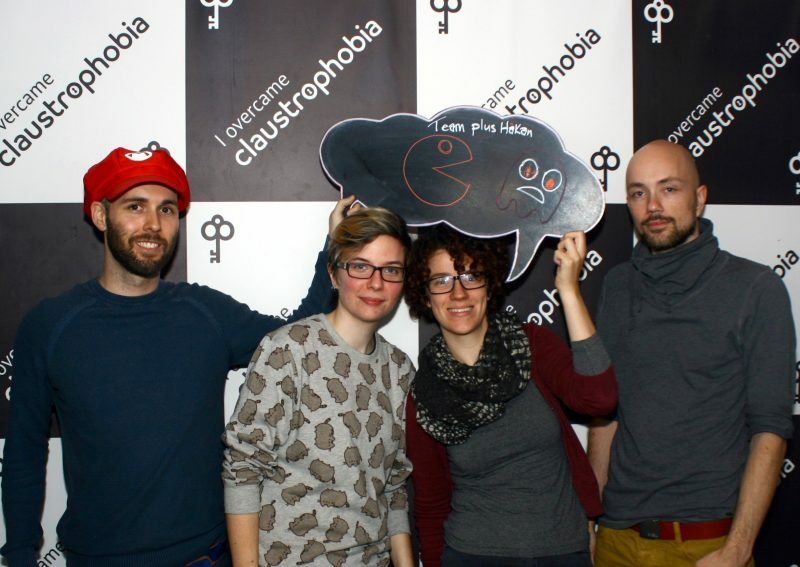 It is our first escape room and first-time players might find it less overwhelming. Paradoxically, it is also a challenging game for experienced players, thanks to its unique puzzles. Arcade Invasion is our newest game and is designed as an expert level experience, challenging teamwork. We do not wish to discourage you from taking on this challenge, note that both games have proven to be enjoyable and challenging for new as well as experienced players. The recommended team size for an intense experience is 2-4 people for WakeUp! and 3-5 people Arcade Invasion. For some groups it is more important to stay together and put more energy in their teamwork, so a total of 5 players are allowed inside WakeUp! and up to 6 people can play Arcade Invasion. Our experience shows that teams of 5 or 6 players greatly enjoy the atmosphere and the team work solving tasks all together. We want to make sure you have the best experience while playing our games, if your team is bigger than the maximum size please, contact us to find the best layout for your event. Can I bring my kids (8+) inside for the game experience? YES! This is an awesome family activity. Our games were designed as an activity for groups of adults, but children can join them to play from the age of 8 and enjoy the adventure. It is actually a lot of fun to see how well kids perform on a lot of tasks as they are usually a lot better at thinking outside of the box and have an amazing imagination. Bring the kids, and have a fun-filled quality time with your family! Without adults, the recommended age limit is 16. Since we are located in the international city of Amsterdam and our guests come from different language backgrounds, the games themselves do not require much knowledge of any language. Language is not a problem inside the games as none of the tasks or puzzles involve language skills. For hints, we offer multilingual games, with 9 different languages, including Dutch, English, French, Spanish, Catalan, Russian, German, Italian or Swedish. Just let your host know about your preferences once you arrive. In other words you will never know unless you try! For a full refund, cancellation or changes must be done 48 hours prior to the start time of your game. The whole experience will last up to 90 minutes, all depending on your teamwork. The game is 60 minutes and the extra 30 minutes are for briefing before and after your game. You can always just drop by for a visit and we will try our best to set up a game for you. But to be sure that you get the game slot you desire, we recommend that you make a booking in advance, via our website, by email or giving us a call. Note that weekends, especially Saturdays, get booked up quickly! Why can not we be more than 5 in WakeUp! or 6 in Arcade Invasion? We think that putting in too many people will compromise the experience. We tested our game thoroughly and established a maximum size of the team for each game. We want everyone to enjoy the experience to its full and therefore, we do not allow teams to be bigger than 5 in WakeUp! or 6 in Arcade Invasion. Is Questomatica a new name for Claustrophobia? Are the escape rooms scary? Questomatica is our new name! We didn’t design our games to particularly scare people but we appreciate the atmosphere inside our games. We have two very different games: “Wake Up!” and “Arcade Invasion”. 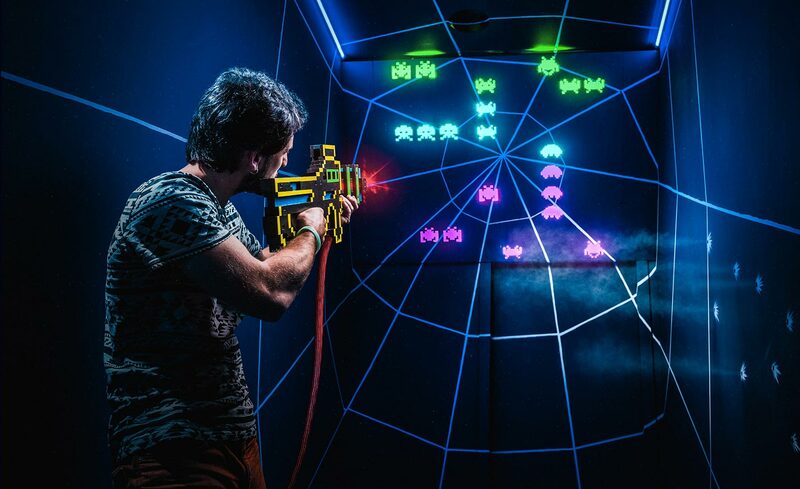 ‘Arcade Invasion’ has never been described by anyone as even remotely scary. The ‘Wake Up!’ game is a little girl’s dream and we all know how unpredictable those turn out. There’s nobody else but your team in the game; and we always keep an eye to make sure everybody is having fun and everything is running smoothly for you. I've played other Escape Rooms with a bigger team. 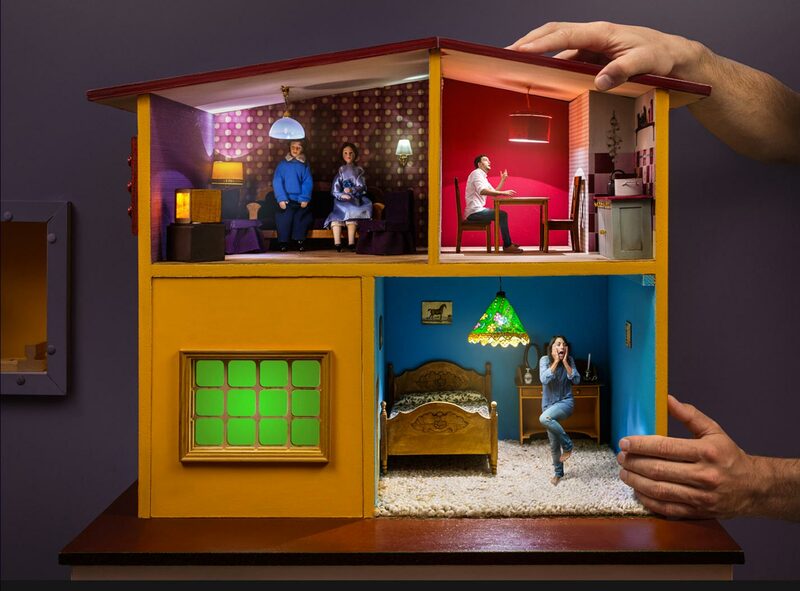 Is your room smaller? No.This time it is not about size but about fun and quality. We heard feedback from other teams that played within a big group and some of the team members stayed aside, didn't enjoy or didn't take an active role in the game. We want to make sure everyone gets a unique and unforgettable experience and increasing the amount of players will result in this not being achieved. When should I arrive to take part of such escape experience? Please arrive close to the time when your game is scheduled as we have limited waiting facilities. We kindly ask you not to come earlier than 10 minutes before your game starts. Should you be running late, please call us. Be aware that if you are late for your game, we may not be able to accommodate you. No. All you need to bring is a strong team spirit. No special skills are needed to play our games and you will actually lock all your belongings upon arrival. Everything you need for this team adventure, is already inside the game. It’s my child’s birthday, can a team of 9-year-old friends play? No. Both WakeUp! and Arcade Invasion are games designed for teams of adults. We had tests with teams of children supervised by one adult and it was not an experience of the quality we'd like to maintain for our games. The minimum age to play in a children's team is 16+ because a smooth experience in our escape rooms requires concentration, focus and some adult insight. We would like to surprise a birthday girl, throw a Bachelor Party or give the experience as a gift certificate! Could we do this with Questomatica? When you make your booking, feel free to send us an email about the special occasion and let us in on the surprise. We will do our best to make the experience extra cosy and enjoyable for all. Our staff is known to go the extra mile and we all love making your special occasion truly unforgettable. 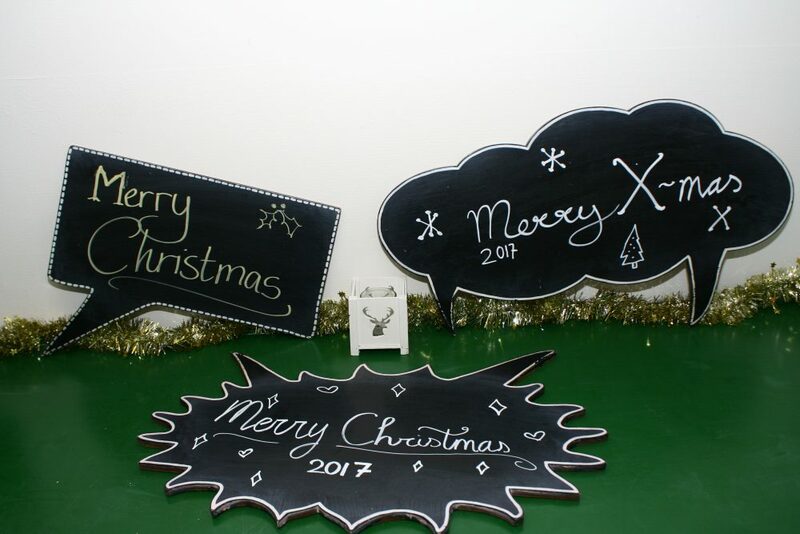 We also offer gift certificates - if you’d like to know more or buy a certificate online click ‘Make a gift’ at the top of our webpage. Can a pregnant woman play the game? Normally we say ‘yes’ but this is obviously at your own risk. It doesn't require major physical challenges and as long as you have a supportive team, we think you'll do just fine. We haven’t delivered any babies here yet! No no no, enough questions for now. Just make sure you are just in time for your game and we will answer ALL of your questions in person! You can also reach us on the phone or use the contact form if you're wondering about something else. 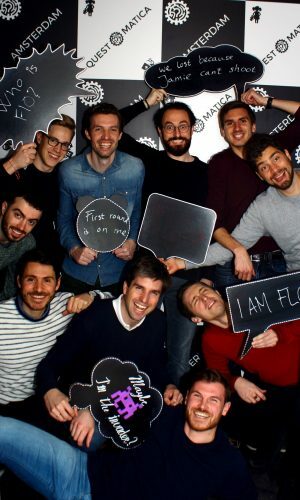 Escape rooms are terrific for corporate events looking for a new kind of team building activity. This is the ultimate challenge for those problem solving skills and testing one’s ability to communicate working towards a mutual goal. With plenty years in the Event Management industry, we are always up for a challenge to satisfy our customers’ needs. We are known to go the extra mile and we love making your special occasion unforgettable. Please contact us to choose the best layout for large groups (up to 45 people and more). 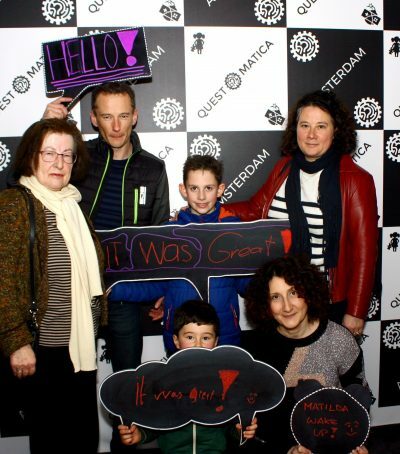 Questomatica escape room experiences are located within 10-15 minutes walk from Amsterdam Central train station, right next to the NEMO Science center. The closest metro is Waterlooplein. If you are coming by car, the exit from the IJtunnel conveniently is just a minute away, and there is usually plenty of parking spots right in front of the quests location.